International Space Station (ISS) program managers, flight controllers, and engineers are currently hard at work analysing the recovery plan following the failure to successfully install Main Bus Switching Unit-1 (MBSU-1) during US EVA-18 on Thursday. While the ISS is currently in a stable configuration, managers wish to get MBSU-1 installed as soon as possible in order to restore the ISS back to full power capability – deciding on a new EVA to take place on Wednesday. 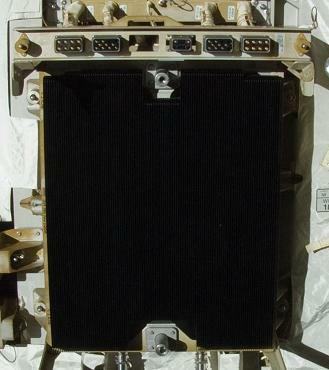 Main Bus Switching Units (MBSUs) are a component of the ISS United States Orbital Segment (USOS) Electrical Power System (EPS), and are essentially electrical distribution boxes for the ISS. A full overview of the USOS EPS is given in the 182-page ISS EPS training manual, available to download in the ISS section on L2. All USOS electrical power is generated via the station’s eight Solar Array Wings (SAWs) at 160 Volts Direct Current (VDC), which is known as primary power. From each of the eight SAWs, the primary power goes to a corresponding Direct Current Switching Unit (DCSU). During times when the SAWs are in sunlight (i.e. generating power), the DCSUs send some power directly to one of four MBSUs, and some power to a corresponding Battery Charge/Discharge Unit (BCDU) which in turn charge the SAW batteries for use during periods of orbital darkness. During orbital darkness, when the SAWs are not generating power, the DCSUs send battery power directly to one of the four MBSU via a Utility Transfer Assembly (UTA), which facilitates power transfer across the rotating Solar Alpha Rotary Joint (SARJ). 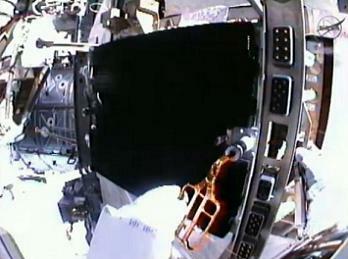 There are two UTAs on the ISS – one for the port SARJ, and one for the starboard SARJ. Once the power has passed the UTA, the four MBSUs on the ISS each receive power feeds from two DCSUs, and as such the four MBSUs between them distribute power from all eight DCSUs and their associated SAWs. These DCSU power feeds are known as channels, and are denoted as 1A, 1B, 2A, 2B, 3A, 3B, and 4A, 4B – the same as their corresponding SAWs (i.e. SAW 1A feeds channel 1A). The four MBSUs in turn distribute power from each of their two DCSU input feeds to DC to DC Conversion Units (DDCUs) via Remote Bus Isolators (RBIs). The DDCUs in turn transform the 160 VDC primary power (which can at times vary by around plus or minus 10 volts, depending on the SAW output) into a steady 124 VDC, known as secondary power. From the DDCUs, the 124 VDC secondary power is sent to the USOS power busses, from where it passes through Remote Power Control Module (RPCM) circuit breakers, from where it can finally be accessed by user loads. Some MBSUs also send primary power to American to Russian Conversion Units (ARCUs), which transform 160 VDC USOS primary power into standard 28 VDC Russian Segment (RS) power, which is in turn distributed throughout Russian modules to supplement Russian solar array power (a completed task during US EVA-18 involved routing power cables from an MBSU to the RS, for use by the future MLM module). 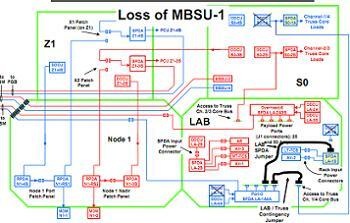 MBSUs can also be cross-tied if necessary in order to effectively re-wire the USOS EPS architecture. Physically speaking, all four box-like MBSUs are installed onto the S0 Truss, as they have been since the S0 Truss’s launch over a decade ago on STS-110 in April 2002, although MBSUs were designed to be EVA-replaceable as part of the ISS’ modular design philosophy. The MBSUs are bolted to coldplates (for thermal coupling) via two “stanchion bolts” that are part of the MBSU’s structure itself, with the two bolts being known as H1 and H2 – H2 being the longer bolt that is driven first, and H1 being the shorter bolt that is driven second. When the bolts are driven, visual indicators on the MBSU move accordingly, in order to inform the crew when the bolt is fully driven. 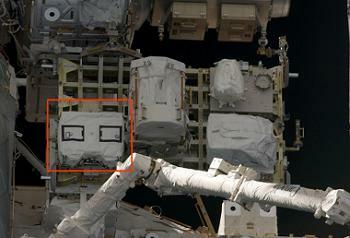 Only once both bolts are driven are the electrical connections between the MBSU and the ISS made via a “dog house” style blind connector – there are no jumpers that connect the MBSUs to the ISS. 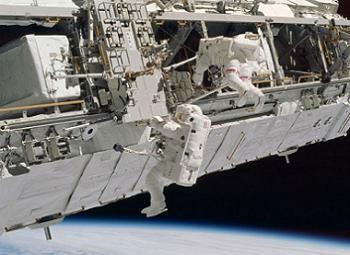 Thus, if the bolts do not fully drive, then an electrical connection between the MBSU and the ISS cannot be made. During US EVA-18 that was performed on August 30, the spacewalking crew of Suni Williams and Aki Hoshide ran into problems when trying to install the new MBSU-1, which ultimately led to the EVA ending with MBSU-1 remaining disconnected from the ISS. While there were some issues with stiff bolts during removal of the old MBSU-1 from the S0 Truss, the problems really began with the installation of the new MBSU-1 in place of the old unit. 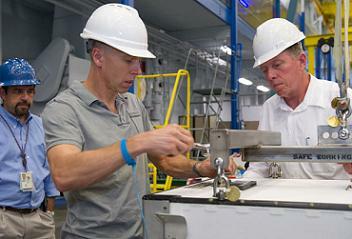 Even before installation was attempted, metallic filings were observed in the bolt socket on the MBSU-1 coldplate, leading to astronaut Suni Williams being required to remove the filings using some EVA pliers. Installation of MBSU-1 was then attempted, however the H2 bolt was unable to be driven, even when taken to the limit of its rated torque. The bolt sockets were then cleaned out again – this time using a nitrogen jet from a tool that was affectionately named “puff the magic dragon” by CapCom astronaut Jack Fisher. 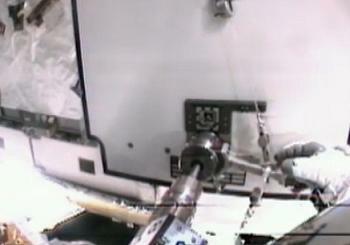 Once the cleaning was completed, a second installation of MBSU-1 was attempted, however the problem of the stuck bolt still persisted, even when a torque multiplier tool was used in conjunction with the spacewalker’s Pistol Grip Tool (PGT). The H2 bolt was able to be turned by 4-5 turns, but following this the PGT torque limiter “torqued out”, and flight controllers did not wish to apply more torque, in case it over-torqued the bolt, which could lead to MBSU-1 becoming jammed in a half-installed position, a situation considered worse than not having MBSU-1 installed at all. Eventually, the spacewalking duo ran out of time to attempt to install MBSU-1 further, leading them to secure MBSU-1 down to the S0 Truss using a long-duration tie-down tether, prior to heading back to the Quest airlock to conclude what turned out to be the 3rd longest spacewalk in history, at 8 hours 17 minutes. MBSU-1 is nominally fed by DCSUs, and thus SAWs, 1A and 1B, however since MBSU-1 is currently uninstalled, channel 1A and 1B are not feeding power to the ISS, meaning the ISS is only functioning at 75 per cent of its normal power capability, given that two of its eight power channels are down. MBSU-1’s loads are currently re-routed to MBSU-4 via the use of a Lab Truss Contingency Jumper (LTCJ) and Station Power Distribution Assembly (SPDA) jumper installed internally within the US Lab module. To avoid over-loading the ISS power busses however, which are limited to a maximum number of kilo Watts (kW) by ISS flight rules, a power management plan was created prior to the EVA, which is still now being carefully continued aboard the ISS. The power plan ensures that, although ISS is only currently running of 75% of its normal power, sufficient power is still available for all necessary equipment. This can be achieved by shutting down non-essential loads that are only needed periodically, such as the Space Station Remote Manipulator System (SSRMS), which frees up more power for vital systems and experiment facilities, such as the Alpha Magnetic Spactrometer-02 (AMS-02). Although the power plan should provide enough power to ensure that no experiment facilities need to be shut down, meaning no science should be lost, co-ordination may be needed to ensure that no two experiment facilities are running simultaneously, but are instead “staggered” to ensure that only one facility is powered on at any one time. Although the current power plan ensures there is enough power for all ISS systems, meaning the station is in a stable configuration for now, the bigger concern is the loss of redundancy associated with having the loads of two MBSUs placed on only one MBSU – meaning if another MBSU were to fail, it would be difficult the distribute all loads between only two MBSUs, producing 50 per cent of the station’s nominal power between them. Given that MBSU-4 is currently feeding most of MBSU-1’s loads, documentation available on L2 shows that if MBSU-4 were to fail prior to MBSU-1 being recovered, then power would be lost to half of the US Lab, Node 1, Node 2, Node 3, the Quest airlock, the Columbus module, the Japanese Pressurised Module (JPM), and one of two Russian Service Module (SM) power feeds. Specifically, this includes the -1 MDMs, the loop A Pump Module (PM), S-band-1, and Control Moment Gyroscope-1 (CMG-1). In this situation, the LTCJ and SPDA jumpers could be reallocated in order to recover most vital loads, such as Multiplexer/Demultiplexers (MDMs), loop A cooling, and S-band communications, but non-vital loads, likely including scientific facilities, would be lost. Also of concern is what would happen in the event of an MBSU-2 failure, since, according to L2 documentation, MBSU-2 has suffered from similar “bit flips”, or anomalous logic upsets, that led to MBSU-1 losing communication capability, which is what necessitated its replacement in the first place. According to the documentation, MBSU-2 is “at risk of [a] bit error that would cause impact similar to MBSU-1”. 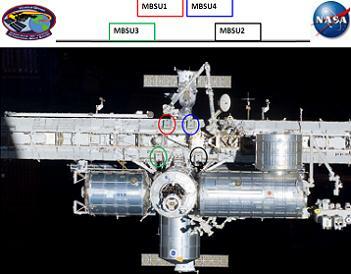 The L2 documentation shows that an MBSU-2 failure prior to MBSU-1 being recovered would result in loss of ISS communications, loss of all Lab and Truss MDMs, the loop B PM and thus loop B cooling, half of Node 3, and one of two SM power feeds. In order for only the vital loads to be recovered, a second LTCJ would need to be used, however since no second LTCJ is aboard the ISS at this time, the Oxygen Generation System (OGS) jumper with pin kit would need to be used as a second LTCJ, along with the Lab system rack jumpers to recover the lab Avoinics-1 (AV-1) rack and the Lab Moderate Temperature Loop (MTL). Since leaving ISS with no MBSU-1 is clearly undesirable for the long-term, ISS managers wish to get it installed as soon as possible, with the latest source information showing that EVA-19 may be performed as early as Tuesday (September 4). UPDATE: That date was the initial option, prior to NASA managers opting to conduct the EVA a day later, on Wednesday, September 5. It is prudent to conduct EVA-19 prior to Joe Acaba, who is the trained robotics operator, returning to Earth aboard Soyuz TMA-04M on September 17 (his mission would not be extended to accommodate the EVA). If EVA-19 is performed next week, sources note that the Japanese HTV-3 unberthing, currently scheduled for September 6, may have to move to the right. As for the actual plan to install MBSU-1, ISS program engineers and astronauts have been hard at work this weekend looking at ground qualification MBSUs to determine possible new installation techniques to get around the stiff bolt issue, given that an MBSU has never been installed on-orbit before , since they were all installed pre-flight. The exact cause of the problem could be related to the fact that the MBSU needs to be finely balanced and levelled prior to being installed, or it could be related to the bolts themselves, either on the MBSU side or the S0 Truss/coldplate side. The iron filings inside the bolt socket could be evidence that the bolt has been galled, however it is unknown whether the galling could be on the old MBSU or the new MBSU – although the old MBSU was bolted into its Flight Releasable Attachment Mechanism (FRAM) Flight Support Equipment (FSE) with relative ease, indicating that its bolts are likely undamaged. Sources note that possible solutions could include using lubricants, along with jiggling the MBSU to ensure the H2 bolt isn’t binding, prior to driving the bolt with higher torque. If these methods fail, MBSU-1 would likely be brought back inside the ISS so that its stanchion bolt could be removed, meaning MBSU-1 could then be tied down onto its coldplate without interference from the bolt, and thus electrical connections could be made. ISS Flight Director Ed Van Cise also noted during a Mission Status Briefing (MSB) on Thursday that although the MBSU electrical connections can only be made once it is bolted in place, it may be possible to produce jumpers in the future that would allow the MBSU to be connected to the ISS without being bolted down. Should MBSU-1 be successfully installed during EVA-19 with time remaining, other deferred tasks from EVA-18 may be performed, such as replacement of the SSRMS end B Camera/Light Pan/tilt Assembly (CLPA), replacement of the Mobile Base System (MBS) mast camera, and installation of a Pressurised Mating Adapter-2 (PMA-2) thermal/debris cover. One spare MBSU still remains on the ISS, located on External Stowage Platform-2 (ESP-2), although a new MBSU will launch aboard Japan’s HTV-4 spacecraft in June next year. The failed MBSU, which also now resides on ESP-2, will not be returned to Earth for analysis and repair, but will instead be used for on-orbit intermediate level (I-level) maintenance, with the maintenance hardware also set to fly on HTV-4 next year, and the actual maintenance activity taking place sometime after that, L2 information shows. I-level maintenance essentially means performing in-situ component-level repairs, something not usually done on the ISS due to its modular design philosophy, with failed units in the past being replaced with entire new units launched from Earth. However, now that downmass is limited in the post-Shuttle era, and also to aid in assessments of cycle times for future Orbital Replacement Units (ORUs), the I-level maintenance will be performed in order to determine, and attempt to repair, the actual failed component inside the old MBSU-1. I-level maintenance will also be vital on future Beyond Earth Orbit (BEO) exploration missions, where launching regular, large spare parts from Earth will not be possible. By beginning to perform I-level maintenance on the ISS, the station will once again serve as the pathfinder for knowledge essential to future human space exploration. (Images: Via NASA, NASA TV and L2 Content.